View and book from over 14 villas from 647 USD per night. Book with peace of mind with our Price Guarantee and local customer support. This gorgeous beachfront villa is located on the West coast of Koh Samui, 10 minutes from the ferry port of Nathon and 35km from Samui's International Airport. Located in the beautiful south of Koh Samui on top of Taling Ngam mountain, experience panoramic views from our private villa unlike any other on the island. Located on the island of Koh Samui, just 45 minutes flight from Bangkok in the Gulf of Thailand, this property is a private 5000-sqm luxury estate. A chic, comfortable 4-bedroom residence with breathtaking ocean views over a picturesque bay. A perfect balance of contemporary and traditional designs. A secluded haven. An elite gateway. A sophisticated residence with unparalleled levels of style, comfort and absolute luxury. 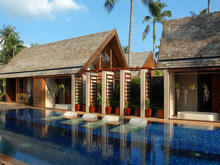 This sprawling 4-bedroom villa rests on prime beachfront property on Lipa Noi Beach on Koh Samui’s sublime west coast. Three bedroom luxury villa with magnificent views, and everything you need for a perfect escape. Unique amongst the other Villas, it is built on split levels, giving it a sense of space, unmatched privacy, beautiful open views and a refreshing gentle breeze. 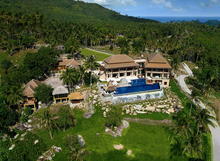 One of Samui’s most exclusive, prestigious and private estate of just six properties, this villa has an instant appeal. Set in one of the most desirable and beautiful areas on the island is truly exceptional. Located in Taling Ngam, one of the most prestigious and tranquil areas on Koh Samui’s west coast, is this picturesque beachfront villa.